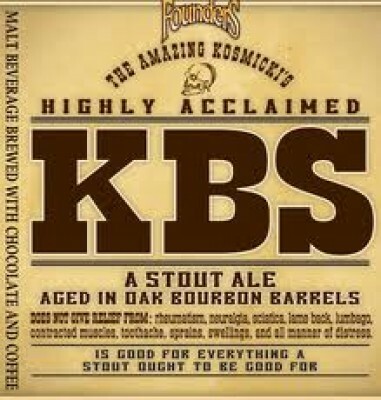 Our much-loved KBS will be released at our taproom on Saturday, March 10th! Kentucky Breakfast Stout! When: Saturday, March 10 at 11am (that’s when we open). Where: Founders Taproom, located at 235 Grandville Avenue SW in Downtown Grand Rapids, Michigan. If you would like to purchase a case, a 4-pack, or individual bottles of KBS, you must enter through the rear entrance. Note: KBS is available on a first-come, first-served basis. Price: $114 per case, $19 per 4-pack, $4.75 per bottle. A strict limit of 1 case maximum per person will apply. Additional Details: Again, bottles will be available on a first-come, first-served basis and are to-Go only (not for on-site consumption). KBS will be available on draft in the taproom as well, while supplies last. And, like all of our specialty products, KBS is not available in growlers. While we fully expect a line for case and bottle sales, we make no recommendations or guarantees as to when the line will begin, so please plan accordingly. The line will begin at the rear entrance to the taproom where signage will be posted. Rock show: The Rock and Roll portion of the KBS Release party begins at 9:30pm, and features the powerpop wizardry of The Total Blam Blams and the rock retaliation that is Love Fossil. A $5 cover for live music begins at 8:30pm. Special fun facts: The Total Blam Blams feature our Head Cellarman Jason Heystek (guitar, vocals), Warehouse Supervisor Kyle Dood (bass, vocals), and Deli Manager Justin Golinski (guitar, vocals). Additionally, Love Fossil features our Head Brewer Jeremy Kosmicki (guitar), Assistant Head Brewer Dave “Diamond” Deschaine (bass), and Sound Engineer Kevin “Scientist” Cole (gadgets, doo-dads). Want KBS but aren’t going to be in town? Use our nifty Beer Locator to find your distributor, then contact them to see where you can find KBS near you!